The Paul E. Tsongas Public Service Award will be unveiled and awarded in future years by the American Hellenic Educational Progressive Association (AHEPA, the largest and oldest association of U.S. citizens of Greek heritage), to public servants who “follow Sen. Tsongas' example of leadership, determination and commitment to responsible public policy.” The late Paul Tsongas, Senator from Massachusetts and candidate for President in 1992, served as a Peace Corps Volunteer in Ethiopia in the 1960's. 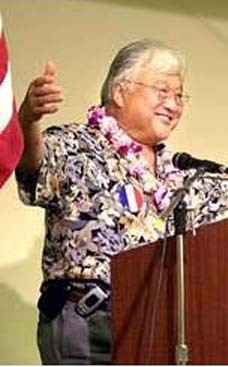 Paul Efthemios Tsongas, the Lowell native whose career in public service took him from mill-town roots to the Peace Corps to presidential candidate, will be honored posthumously tomorrow with a public-service award in his name. AHEPA, the largest and oldest association of U.S. citizens of Greek heritage, is holding its 83rd annual national convention in Boston this week. The Tsongas award will be unveiled at the group's Grand Banquet tomorrow at 7 p.m.
Michael Dukakis, the former governor and presidential candidate, will serve as the banquet's master of ceremonies. Tsongas' widow, Niki Tsongas, will attend the banquet with her daughter, Molly, and close family friends. “I think it's very nice that this long after Paul has been gone, eight years, people still feel it's important to recognize his service and public life,” said Tsongas, dean of external affairs for Middlesex Community College. “I think it would be special to him, and he'd be very pleased by it,” she added. 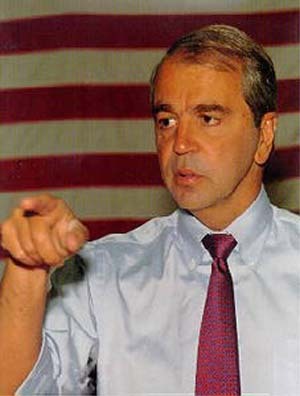 Tsongas, the son of a working-class Greek father, died at 55 in 1997. But he left behind a life of accomplishment that threatened to make politics honorable. 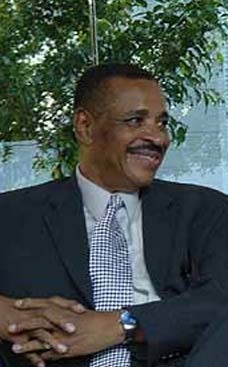 In the 1960s, he volunteered in Ethiopia and the West Indies with the Peace Corps, then went on to become a Lowell city councilor, county commissioner, two-term congressman and U.S. senator from 1979 to 1985, leaving after being diagnosed with cancer. He fought the illness, resumed his law practice in Boston and ran for president in 1992. After winning the New Hampshire primary, Tsongas' presidential bid faltered when Bill Clinton's resurgent campaign picked up steam and lots more money than Tsongas could raise. 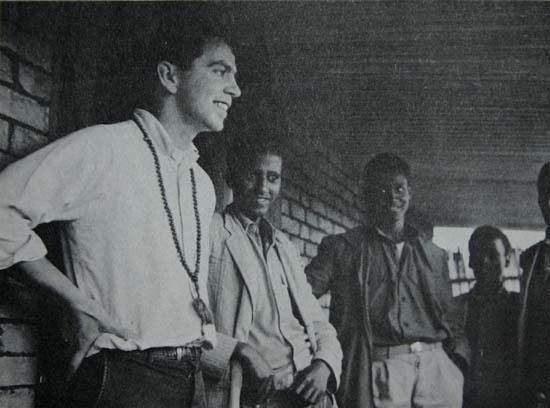 Caption: Peace Corps Volunteer Paul Tsongas served in Ethiopia in the 1960's. Beginning next year, the award will be given to “a public servant who follows in the mold Senator Tsongas left behind,” Kaffes said. A business-friendly progressive, Tsongas “was a man who blended different political philosophies,” Kaffes said. “He was considered a centrist by many peers,” he added. AHEPA's convention, running through Sunday at the Sheraton Boston Hotel, is expected to draw as many as 2,000 Greek-Americans from across the country, and some 700 are expected at the Grand Banquet. 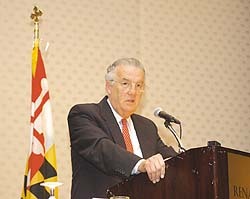 Paul Sarbanes, Maryland's Democrat senior senator and the son of Greek immigrants, plans to attend. Sen. Edward Kennedy, who served with Tsongas in the Senate and called him a man with a “special vision of America” that was “both idealistic and realistic,” has been invited. Dukakis will speak about his remembrances of Tsongas, Kaffes said. Tickets for the banquet, which starts at 7 p.m., are $125 and are “very limited,” Kaffes said. For information, call (617) 236-6088 and ask for the AHEPA office. David Perry's e-mail address is dperry@lowellsun.com. The late Paul Tsongas, Senator from Massachusetts and candidate for President in 1992, served as a Peace Corps Volunteer in Ethiopia in the 1960's. Paul Tsongas, the former Massachusetts Senator, in 1992 a presidential candidate, died over the weekend from liver failure and pneumonia. He was 55 years old. JIM LEHRER: Paul Tsongas, the former Massachusetts Senator, in 1992 presidential candidate, died over the weekend from liver failure and pneumonia. He was 55 years old. Tsongas served two terms in the House and then was elected to the Senate in 1978. In 1984, after only one term, he was diagnosed with cancer of the lymph nodes. He decided not to seek re-election so he could undergo aggressive treatment and be with his wife and three daughters. After a bone marrow transplant from his twin sister, his health improved, and he resumed his law practice in Boston. In 1992, he sought the Democratic presidential nomination, running second and went to the primary season behind then Governor Bill Clinton of Arkansas, who, of course, went on to win the presidency. During that campaign, Tsongas appeared on the NewsHour and discussed his political and personal philosophies with Judy Woodruff. FORMER SEN. PAUL TSONGAS: (April 10, 1991) I have been referred to as a pro business liberal. I have always been referred to that way. That is what I am. On traditional Democratic issues, human rights, civil rights, women's rights, the environment, I am a liberal, and I make no apology for that. But in terms of energy policy and in particularly in terms of economic policy I am a realist. I may sound like a Republican but if it works, I am for it. I am not locked in to the ideology, sort of the class warfare, corporate bashing that Democrats find attractive. That is not me it has never been me. JUDY WOODRUFF: (April 10, 1991) Another question that I think that some people who look at you and your life experience: Here is someone who had a life threatening illness, cancer, who went off and had time to consider what is really important in life. You had time to spend more time with your family. Why would you then throw yourself back into the fray of this crazy schedule that a Presidential candidate that he has to out himself or herself through? FORMER SEN. PAUL TSONGAS: It is going to sound kind of syrupy but I survived. And there is an obligation of that survival. If there was somebody else who thought the way that I did, who has had the experience that I have had, if a Bill Bradley, for example, had run I would have supported it. But I honestly believe, as strange perhaps as it may sound, I know what this country has to do and where we have to go to avoid the economic decline that I experienced as a child. So what am I supposed to do? Sit back in Lowell, Massachusetts, make my money as a lawyer, protect my family, and say well the rest of you are on your on. I think I went through a lot, and I have an obligation back and that is what I see myself doing. That is what my family sees me doing. And I know that may sound unusual in the Washington context but that is how I feel. JIM LEHRER: A few thoughts now about Paul Tsongas. Mark Shields and Paul Gigot are here. So is Boston Globe Columnist Mike Barnicle, a NewsHour regional commentator. Mike, how would you describe Paul Tsongas? MIKE BARNICLE, Boston Globe: Well, I would describe him, Jim, I think as a nice man, a smart man, and I think most of all in my mind someone who, it sounds corny, but someone who literally never forgot where he came from because he couldn’t, because he never left where he came from. I was struck today watching the President in his inaugural address, and I can recall when he ran, he was billed as the man from Hope, Arkansas. And I think he was in Hope, Arkansas, for, you know, maybe three months or so. Paul Tsongas lived on a hill in an old mill town in New England, Lowell, Massachusetts, a hill where the rich people in town always used to live. He made it up to the top of that hill in a beautiful home. And from that home you could look down on a clear day in the Meramac Valley in January and see where Paul Tsongas lived as a child. It was that close and yet that far away from his roots. His father was a dry cleaner. His mother died when he was quite young. And Paul Tsongas literally knew everyone on Main Street in Lowell till the day he died. And I think it’s an unusual sort of person who can achieve the United States Senate and run for the presidency of the United States and still maintain those roots and the strength of those roots as he did. JIM LEHRER: --with Judy, and you think, my goodness. I mean, politicians don’t talk that way. Was he really that way? MIKE BARNICLE: You know, I think he was. He could be, you know, he could be kind of smug and arrogant at times. I don’t think there’s any question about that, especially with the media, but we deserve to be treated that way. But I think his cancer changed him a great deal. I think the fact that he combated it successfully gave him the opportunity to realize and to articulate publicly during the course of his presidential campaign that there was a tremendous market in this country for truth. And when he ran for the presidency, having faced death, he was certainly unafraid to tell the truth as he saw it. And I think to us that might make him seem unusual, but I think to the average person it would make him seem someone with just huge amounts of common sense. JIM LEHRER: Yeah. How do you think we should remember Paul Tsongas, Mark? MARK SHIELDS, Syndicated Columnist: Well, Jim, most Americans who run for President lose. And most Americans who lose leave that race--the presidential candidate--with their reputation, their stature, their popularity diminished. Paul Tsongas was that rarest of candidates. In 1992, he not only shaped the entire debate of that campaign, the fact that we’re seriously debating a balanced budget in 1997 is testimony to Paul Tsongas, who treated voters like grown-ups, albeit grown-ups with an unlimited capacity for cold showers and root canal work sometimes. He was very tough, very direct, but I mean, he thought more about being President than he did about running for President. He put his ideas in a book between covers, forced other candidates to do the same thing. JIM LEHRER: And he would say read my book. MARK SHIELDS: Read my book. And so it was absolutely remarkable in that sense. And the other thing, the other thing was that he hadn’t, you know, gained to the whole thing. Paul Tsongas was an acquired taste politically. He was not a back slapper. He was not easy. He was not personable--didn’t have a funny line or whatever. And so in a state like New Hampshire, where he could spend a lot of time and people were convinced by the strength of his arguments, the sincerity of his character, he could win that in 1992, but after that, the primaries tumbled very fast, and the premiums on being a great first date politically, which he wasn’t, he was sort of a Willy Loman carriage and self-effacing manner and an Elmer Fud delivery. But there was a strength and a--really a--I guess, decency Mike says, and that was there, genuineness, I would say. There was a genuineness about Paul Tsongas that one rarely encounters in this business. PAUL GIGOT, Wall Street Journal: New Hampshire was the perfect place for him because he did have time, because they did want you to dot your "i’s" and cross your "t’s", and he had a comprehensive program. He also had a compassion. That’s what I admired about him in that campaign. He really was on a mission. And he was going to deliver it no matter if Bill Clinton could use the entitlement card in Medicare to beat him up in Florida, as he later did, or not. He was going to take that risk. One caveat, though, and I think this was something that he probably came to later regret, and that is that in that campaign of 1992, he was not completely candid about his illness. He had had a relapse, and he was swimming to show that he was--he could be President, and he knew about that relapse. And we later found out. And I think he later came to regret that he had not admitted that. JIM LEHRER: What do you think about that, Mike? What’s your take on that, the thing about his--whether he was sick or whether he wasn’t sick? MIKE BARNICLE: Well, I don’t know whether he lied or not. I do know that, you know, if he didn’t tell all the truth there was to be told about his illness, he certainly finished second in the department of not telling all the truth about certain things to other candidates in New Hampshire who went on to be more successful, but I think he viewed his illness--I think he said that at one point in the later stages of his life that he--as Paul pointed out--that he did regret not coming completely clean with his affliction, with the cancer, but he didn’t know, he didn’t really know the extent of it. And when he died Saturday evening, he was cancer free. He died from, you know, liver problems and pneumonia that were a direct result of his being treated for cancer, but, you know, now that, you know, that he’s passed away, you know, I think we should really reflect on here was a man who was, you know, from the Lowell City Council to the Middlesex County commission which was, you know, a rather arcane function of government up here to the Congress, to the United States Senate, to a run for the presidency. He gave up an enormous amount of power that could have been his in 1984--he certainly could have won re-election--for his family. He chose his family over his career. He had a life apart from politics, which I think made him more interesting than many people who are in politics, and that’s all they are about as politics. Tsongas was about much more than politics. JIM LEHRER: Well, let’s leave it there. Thank you, Mike. Paul, Mark.